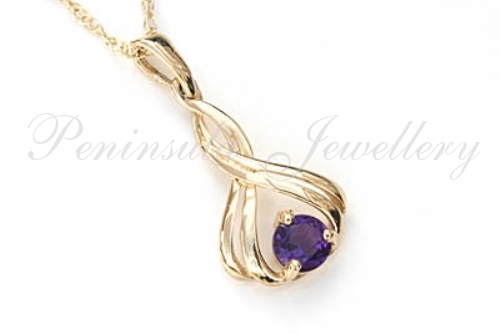 Fancy pendant with one 4mm diameter round cut Amethyst gemstone which has been claw set and nestles safely in a contemporary crossover design. 9ct gold setting and bail. Dimensions: 21mm long, including bail. 10mm wide at the widest point. Comes complete with a 9ct Gold 18 inch Prince of Wales chain. Made in England. Presented in a luxury gift box – Great Gift! !